"Easter is a symbol of hope, renewal and new life." - Janine di Giovanni. Celebrate the renewal of life with this collection of Easter worksheets for kids featuring myriad literary, math, coloring and craft activities. Make Easter cards, go egg hunting and count your eggs, fix the Easter Bunny, unscramble sentences, sort syllables, read and color, write the Easter story, decorate eggs, solve puzzles and mazes, make a line plot, put the fact family members together, solve word problems and much more. Express your love and communicate your feelings with this Easter card comprising a cute little chick, an Easter Bunny and colorful Easter eggs and let your family and friends know that they are 'Eggstra' special. 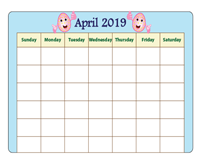 Stay organized for the entire month of April, make a note of the important days, schedule your work and plan events with ease. Kids of kindergarten, through grade 3 can use their creativity to make the calendar attractive. The Easter Bunny has been busy hiding the eggs. Look up and down, search behind the bush and on the tree, hunt for eggs, count them and write the answer in the box to complete this fun egg hunt on paper. 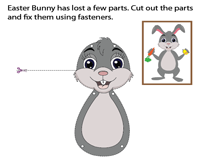 Spark interest and foster creativity in kids of grade 2 and grade 3 with this Bunny craft worksheet. The Easter Bunny has a few missing parts, snip the parts and put the Bunny together using paper fasteners. Review syllabication with this Easter syllable sort worksheet. Look for the number of syllables in the words given in the word box. 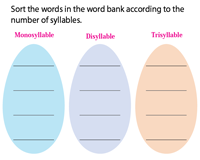 Classify them as monosyllables (1), disyllables (2) and trisyllables (3) and write in the appropriate eggs. Snip the words, rearrange them to make two Easter sentences, glue the words and write the sentences formed. 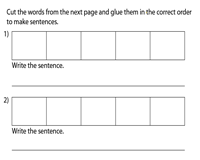 This cut-and-paste activity worksheet helps kids understand the basic word order S-V-O used in the formation of a sentence. 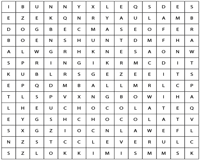 This Easter word search activity worksheet comprises a 14 x 14 grid. 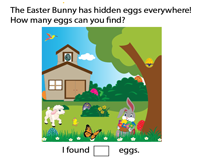 Get exposed to 10 Easter vocabulary words, develop word recognition, build fluency and spelling skills as kids look for words letter by letter. Kindergarten and grade 1 kids take their first step in reading and comprehending. 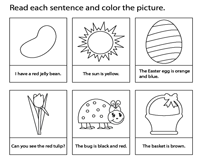 Read the sentences carefully, visualize the picture, infer the information and color the pictures based on your comprehension. Children of grade 5 can research a little or find out from their parents about why Easter is celebrated. 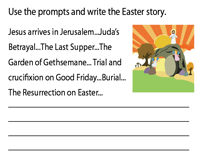 The prompt can be used as a guideline to write about the Holy week from Palm Sunday to Easter Day and build narrative skills. 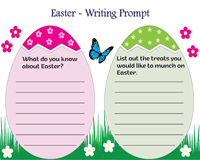 This visually appealing Easter writing prompt worksheet for 3rd and 4th grade kids enhances thought processing skills and inspires kids to get creative. Kids answer four simple questions and develop an entire essay in the process. Shapes and colors as we all know are the building blocks of cognitive development. The Easter egg is filled with shapes. 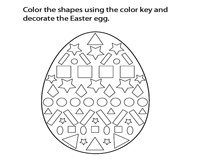 Identify the shapes, follow the color key and decorate your Easter egg. Puzzles are tools that improve concentration and memory. 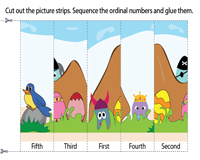 Arouse interest in kids as they cut the picture strips, sequence the ordinal numbers and glue them in order to reveal the mystery Easter picture. Completing a maze is a wonderful way to enhance problem-solving skills and skip counting lays the foundation for multiplication skills. 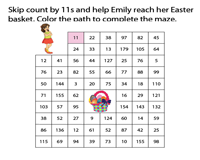 Trace Emily's path through the maze and help her reach her Easter egg basket as you skip count in 11s and develop twin skills. The Easter eggs have multiplication and division facts written on them. 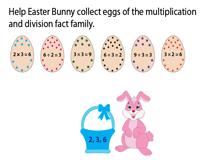 Help the Easter Bunny find the members that belong to the same family of numbers written on the basket and understand the relationship between multiplication and division in the process. Applying concepts to real-life situations is what makes math interesting. 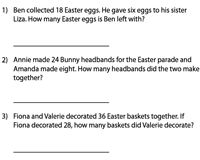 Read the Easter themed scenarios and solve addition and subtraction word problems offered here for kids of grades 1 and 2. 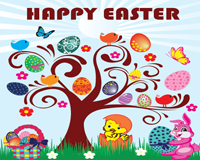 Egg hunts are the most common traditions of Easter. 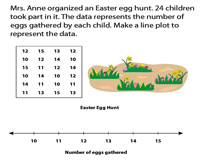 The table shows the data of the number of eggs collected by the kids. Graph the frequency on a line plot and organize data in this worksheet. How about some fun this Easter? Try your luck with the Easter bingo. 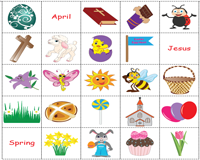 Get your Easter bingo cards ready, follow instructions, listen attentively to the caller and get ready to bingo when you complete the predetermined pattern. Have you gone egg hunting during Easter? Have you heard of a flashlight egg hunt? Read the passage to find out what happens at Janet's egg hunt at the rec center and answer a few questions based on your comprehension.